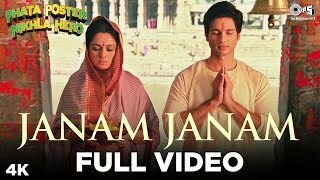 'Janam Janam', a perfect depiction of Mother-Son relation; by Shahid Kapoor & Padmini Kolhapure in Phata Poster Nikhla Hero. In the heartfelt vocals of Atif Aslam, the song is penned by Irshad Kamil. To enjoy the music album on Saavn click on the link below. Hear the full song on Gaana, click below link below.